Solid 2 hrs on 7m+surfboard at the early morning shift. Small disorganized waves inside but clean waist to chest high waves outside. Waves improved as tide dropped. Tons of toeside hits and awesome wave rides. Good slacker turnout including 4 windsurfers. What? No pow sesh at Cypress this morning? Good times at 3rd, perfectly powered on the 10m from 11:30 till 1:45. Cash seemed to figure out his new rebel in the second sesh. Wow, going huge. Rise. Most of the go-to forecasts favoured the afternoon, but morning actuals and Faceplant’s OSR put me into motion early. Sent a text to the jet-lagged-local (Michael) and he showed up along with Simon too. Mike and Dave MH also on windsurfing gear launching from down at Centennial. Saw Alton, Slappy, Cash and lots of others on kites off 3rd. Pretty sure I also saw Chuck bending his 6 degree minimum. Solid wind and organized smoothies over the second bank made for some fun moments. A few of the smoothies had enough girth that they could mow you if you got in too deep and didn’t pay attention to the white water. The 2 m tide over the second bank is about as close as we have to a reef set-up here – regular standing waves, just too bad the wind/wave angle is so onshore. Got a bit of a fright when one kiter’s no-look-boost turned into a slack line Hindenburg on landing, then at the last second the wide-eyed kiter was startled after reloading his kite after he finally looked up and realized how close he was to me. Called the morning session when the wind backed about 11:00 am and headed off to grab a warm lunch. Thanks for the lunch Michael! Lighter. Headed back to the boat ramp for round two after a quick look-see at Gabriel’s Beach in Point Roberts. Massimo and I took to the water about 2:30 pm. Nice cool-down session. But Shadow didn’t seem too keen on hitting the water. Semi-playful water with the swell rolling into shore a little more on the rising tide. Two for two today (even if different than expected)! Got to 3rd at 3:30 and on the water at 4:00. Thought it was going to be a good session, then it clocked SW after 30 minutes. Dashed to shore and managed to make it in and had a short walk of shame. 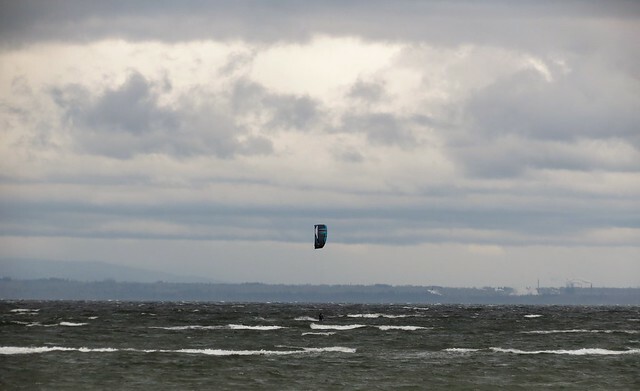 Headed over to ferry terminal for a really fun session boosting in 20 knot wind until 8:00 with 8 others. Took the morning shift, on the water 9:00-1:00 on 6.5m + SB. Nice waves for the first half then it flattened out. Pretty sure I also saw Chuck bending his 6 degree minimum. 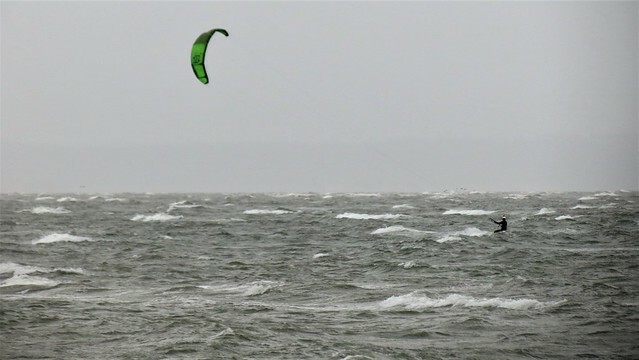 Had a three sport day of kiting, swimming and walking after a line broke out by the second bank on the flooding tide. Was about to hit the release after kite loopy looped into the water but realized in tu e it was my safety line that snapped Would have been a lost kite! Monkeyed up the remaining frontline and secured the kite, glad i didn't get hog-tied in the process by the trailing lines and bar! Fortunately was early in the sesh so lots of gas left in the tank. Stoked to realize busted line was in fact a busted line extension! Hit the water around 8:30 with Dave and Simon. Took the Kode out again for another test drive but I was not comfortable at all at the start today. Over powered, choppy waves pelting rain and cold hands. Felt more like January than April and after 3 weeks in Aus I was not lovin it! Also that board is like driving a sports car and I didn't want to crash it. Came in, warmed the hands and grabbed the beat up Tabou, the waves got better, great for riding no so much for jumping, had some fun rides sailing from 3rd down to Centennial. Bit of a walk back but worth it! No more wind for a while, hope May brings some warm spring sessions.